his need for chewing and gives him a good ‘workout at the gym’ – leaving him tired and content! This page is not intended as a substitute for veterinary advice. Please discuss any dietary changes with your vet before changing your dog’s diet. If you would like to contact a vet recommending raw feeding, please email Dr Sarah Stieg at drsarahstieg@gmail.com. Some people think that feeding a raw diet is timing consuming, messy and that they need to know a lot about nutrition to feed a balanced diet. This couldn’t be further from the truth. 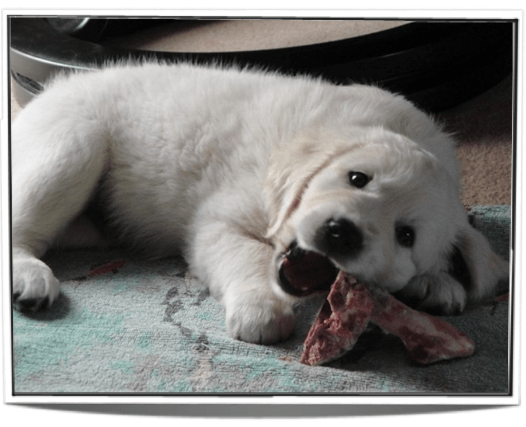 What could be easier than thawing out a tube of complete frozen food for your dog? There are a number of excellent books available for those wishing to learn more about feeding as nature intended and Raw Food Vets is a useful website for anyone wishing to find a vet or trainer recommending the BARF (bones and raw food) diet. If you would like to learn a little more right now, please click on the film reel below to see a short video from Jonathan Self, founder of Honey’s Real Dog Food. For more information please visit www.honeysrealdogfood.com. This is an excellent plain-English book for anyone wishing to learn more about raw feeding. Filled with useful facts, it explains what dogs eat in the wild, how to switch to raw feeding with ease and its associated health benefits. The book also discusses a number of common ailments and has a useful “Other Sources of Information” chapter for those wishing to delve into raw feeding in greater depth. 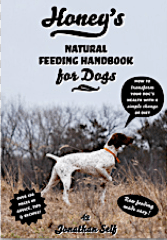 Recommended reading for owners considering a switch to raw feeding and the more experienced raw feeder alike, or simply as a gift to a fortunate recipient, this is a useful addition to any dog-lover’s library.